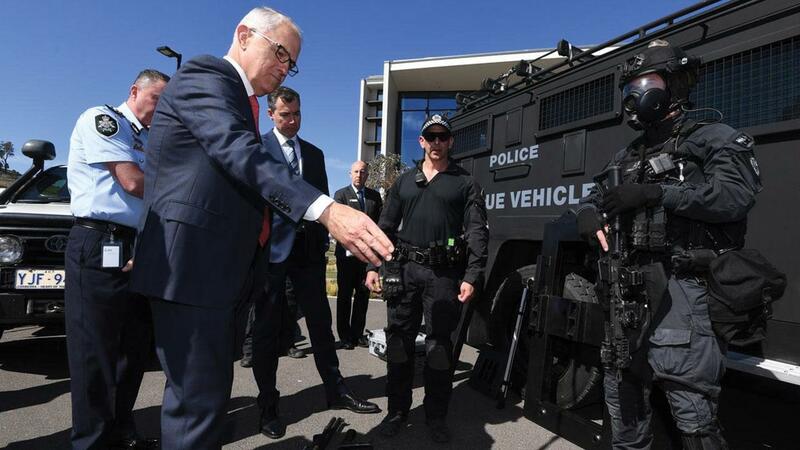 To protect the people of Australia our political leaders are looking to expand anti-terrorism laws. Earlier this week, the Federal Government announced that they will be seeking to implement uniform detention laws around the country that would see suspects of terrorism crimes being held in detention without charge for up to 14 days. The basis of ensuring it is constitutionally defensible is obviously bound up with experience, with further advice, and also by having a judicial officer, a magistrate, extending the period of detention, which is how it operates at the moment. Risk being seen as punitive, in other words do they risk breaching the separation of powers doctrine and undermining the integrity of the court. The federal Government has approached the States to work with them in the creation of new laws. NSW already has legislation that allows the police to hold people for 14 days without charge. While the other States allow a person to be held for a shorter period without charge. The aim is to ensure that all of the States and Territories, as well as the Commonwealth, have the same laws. On top of this the Government would like to obtain all the photographs that have been taken of Australians that have driver licenses and use them for facial recognition. This will require cooperation within the federation as driver licenses are issued by the States and Territories and as such they hold the databases. Australians might be receptive to this, as it is widely known that it took some time to identify the assailant at the Lindt Café siege in 2015. Facial recognition technology may have been able to identify him more quickly, but whether that would have resolved the siege faster is not clear. A similar, secretive plan by the FBI last year caused uproar in the US when it was finally discovered. This week we will examine the principles that underlie detention in respect to the rule of law. The principle of Habeas corpus goes back as far as the Magna Carta in 1215, when the English Barons made a stand about being thrown in jail whenever the King liked. It has been expanded and codified since this period. Executive power which cannot be supervised by courts tends to be dangerous. Those who hold power which cannot be supervised or controlled tend to take it beyond its proper bounds: it is the way humans are…. ….The principle of legality carries with it the assumption that the lawfulness of executive action is examinable in the courts. Liberty is one of the most fundamental and cherished of all rights. Where a person is deprived of their liberty, habeas corpus is the device which enables the lawfulness of the detention to be examined. It is perhaps because of this principle that the Government has stated that the new laws will ensure that a magistrate is involved when a suspect of terrorism crimes is to be detained for up to 14 days without charge. In the Australian Constitution each of the three branches of Government are stipulated in different Chapters. Chapter I is entitled the Parliament, chapter II, the Executive Government, and chapter III the Judicature. The separation of legislative, executive and judicial functions and powers means that the Parliament cannot exercise judicial power. Also, the Parliament cannot create legislation that would impair the judicial power of the courts. The Constitution prohibits the federal Parliament from interfering with the judicial power of the Commonwealth and it also prohibits the States from doing so. In the past, the High Court has had a conventional view when determining judicial power. For example, if detention is a punitive measure, then a person can only be punished after being found guilty of a crime in a court. In the last 10-15 years there has been more restrictive anti-terrorism legislation enacted. Several of these laws have been tested in the High Court and have been found to be valid. Some people (civil libertarians and privacy experts) have questioned the need for more anti-terrorism legislation. They state that our rights and liberties are slowly being eroded and chipped away. Most Australians seem to be okay with the increasing anti-terrorism legislation. But some argue that it is perhaps time to start taking more notice of the change in the balance between our rights and safety. Some question the push to use driver license photos for facial recognition. Australians handed over their details and allowed a photograph to be taken for one purpose with their state or territory government and now there is a move to use these details for a different purpose, with another level of government. One of the concerns is the safety of that data. Is there a chance that the information might be hacked and used for nefarious purposes? Will this database make the community safer? And how does that balance with our right to have our data and photographs safely stored for the purpose that we initially consented to? One of the arguments recently presented by those questioning the expansion of anti-terrorism is the effect on the rule of law. The rule of law means that we are ruled by laws, not by men (or women). It also requires that laws be known and accepted by the community. While the public seems to accept the need to be protected, if they are not taking much notice of the changes, are the laws known? The massive expansion of police and detention powers being proposed by the Prime Minister is yet another erosion of Australians’ basic freedoms….Detention without charge is completely unjustified and incompatible with the rule of law and basic freedoms….The wider use of facial-recognition software will affect every Australian’s privacy. We’ve obviously had a lot of experience of our existing laws, the way they operate at the moment, they’ve been operating very well, with a magistrate being able to extend the period of pre-charge detention, so the aim is to agree with the states, and obviously this has got to be worked through legally, they have got to get their own legal advice, but the aim is to have consistent pre-charge detention laws that would enable somebody who has been charged to be detained and questioned for up to 14 days, with of course all of the appropriate oversight….This is absolutely consistent with ensuring that there is appropriate judicial oversight. As long as the legislation for the detention of terror suspects is not deemed to be punitive, it may be allowed under the executive power. Having a magistrate involved in the detention process is also a safeguard against an excess of executive power. Of course, if a person is detained for 14 days and then released without charge, the High Court may be asked to decide if the law is valid. Especially because it has been stated that the new laws will enable 10 year old to be held for up to 14 days without charge. We’ll have to wait and see what happens as a result of the States meeting the federal Government on this issue.